Recent progress in materials science has led to the creation of new magnetic materials in which the magnetism follows complex patterns. 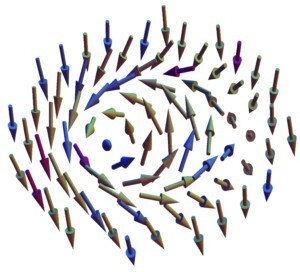 Magnetic skyrmions are vortex-like configurations in magnetic fields, as shown in Figure 1. Because skyrmions can be manipulated by electric currents and temperature changes, they may have applications in magnetic memories and logic devices. In order for these complex magnetic patterns to form, however, a material must exhibit strong spin-orbital coupling. This means that an electron’s spin (analogous to Earth’s rotation on its axis) is in the same direction as its movement around the atomic nucleus (analogous to Earth’s orbit around the sun). To see how spin-orbital coupling affects a skyrmion’s behavior, imagine a spinning ball moving through a stream of air molecules, as shown in Figure 2. As the ball spins, it drags some of the air molecules with it, deflecting the air flow in the direction of its spin. This slows down the air flow on one side of the ball while speeding up the air flow on the other side. Since faster-moving fluids exert less pressure than slower-moving fluids (a phenomenon called the Bernoulli effect), a force called the Magnus force is produced. This force moves the ball away from the area of high air pressure and toward the area of low air pressure, as demonstrated in the video below. 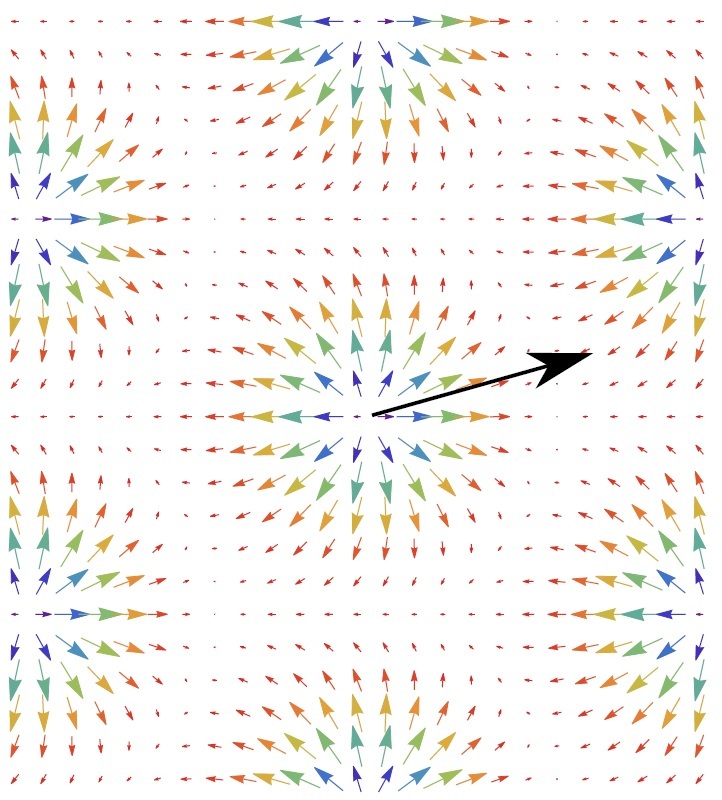 In the same way, a skyrmion subjected to a “wind” of electrons will experience a Magnus force in the transverse direction (Fig. 3). Fig. 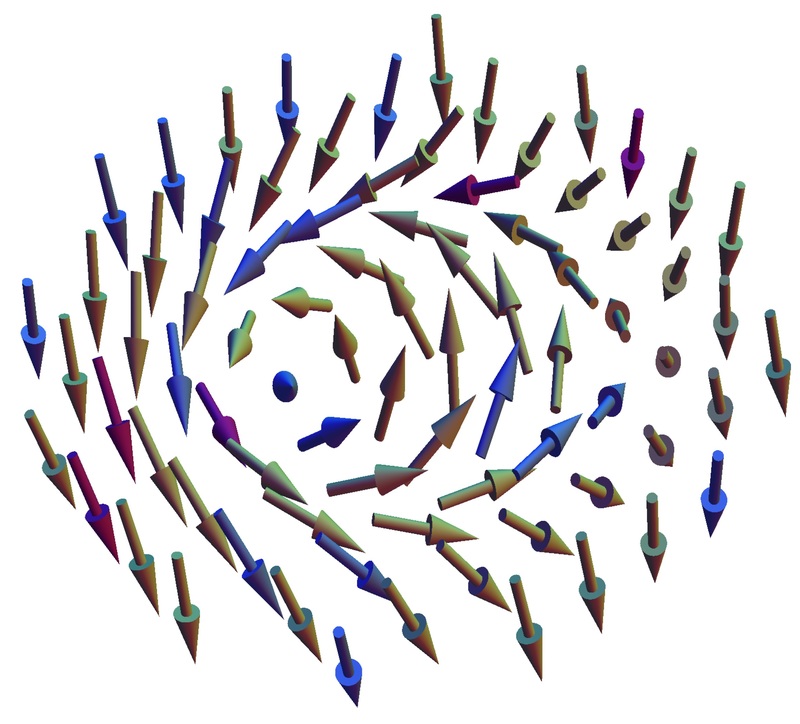 1 (Click to enlarge) A magnetic skyrmion occurs when the direction of magnetization in a magnetic field forms a vortex-like pattern, as shown here. Fig. 3 (Click to enlarge) Just like a spinning ball, a skyrmion subjected to a wind of electrons will experience a Magnus force in the transverse direction. 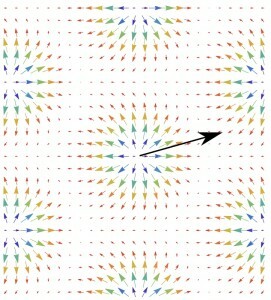 The arrow shows the direction of the skyrmion's motion.